Have a clever saying or just want to make a cute DIY onesie for a new little one in your life? 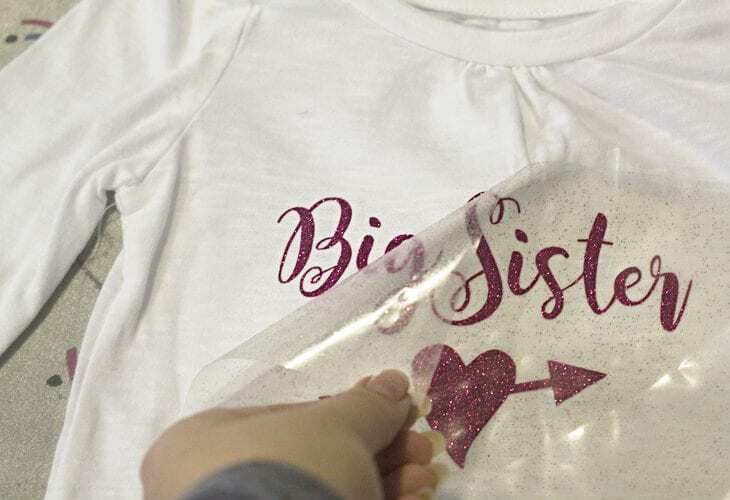 See how easy it is to make a custom onesie with heat transfer vinyl. But, how do you do it? 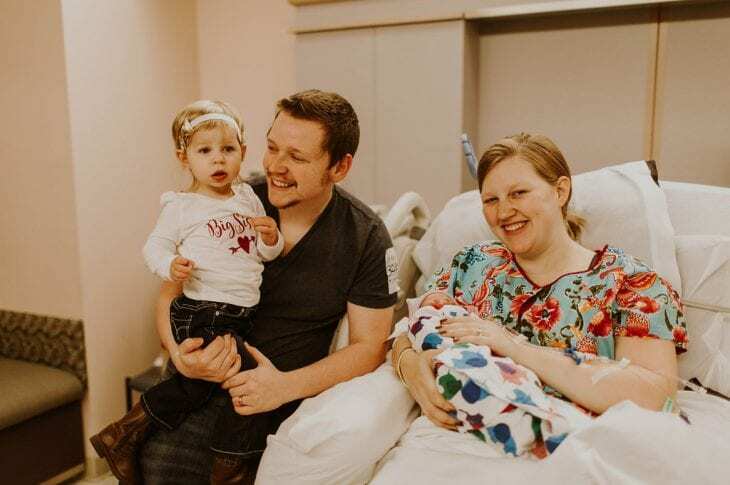 For my first little, we announced her name and birth with a name tag and it turned out so cute, however, I knew we needed to come up with something equally as fun for baby #2. A Facebook post isn’t just going to cut it. One night, as I was scrolling Pinterest it hit me — make a DIY onesie! I had always heard about heat transfer vinyl (HTV), but was too intimidated to use it. Well, intimidated no more! I’m in love!! I’m not sure why it took me so long to get past that fear. Here’s how to make a cute onesie with heat transfer vinyl. We actually named her after my great aunt who we lived with when we got married and she died a few months into our marriage. She was the spunky, fun aunt and full of life. She was a great reminder to always look for the good things in life. Even when she was in and out of the hospital she always had a smile on her face and was looking for ways to make people laugh. 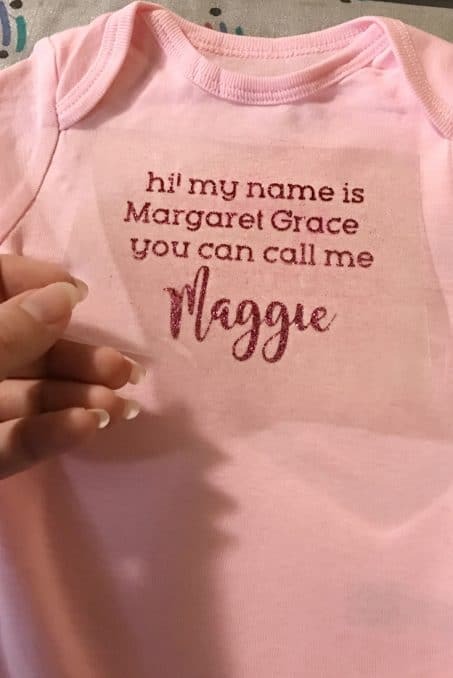 Although we love the name Margaret, we really wanted to call baby Maggie from the beginning and we wanted to make that clear to people when we announced her name, so this onesie was the perfect way to do that! 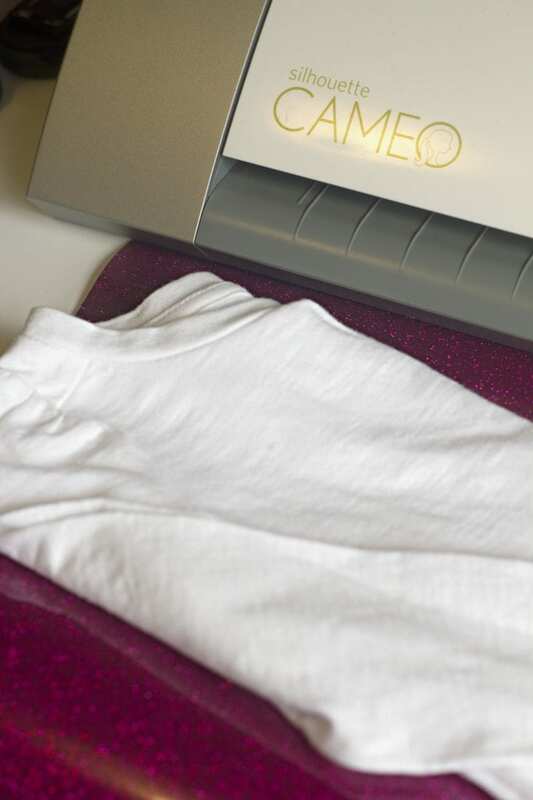 Cutting machine — I love my Silhouette Cameo! Start by creating your design in your design system. I just typed up what I wanted directly in the Silhouette Design Studio. I used Rockwell and Magnolia fonts. The key to HTV is you have to mirror the design so it cuts out backwards. In your Silhouette software select your design, right-click, and select “flip horizontally”. 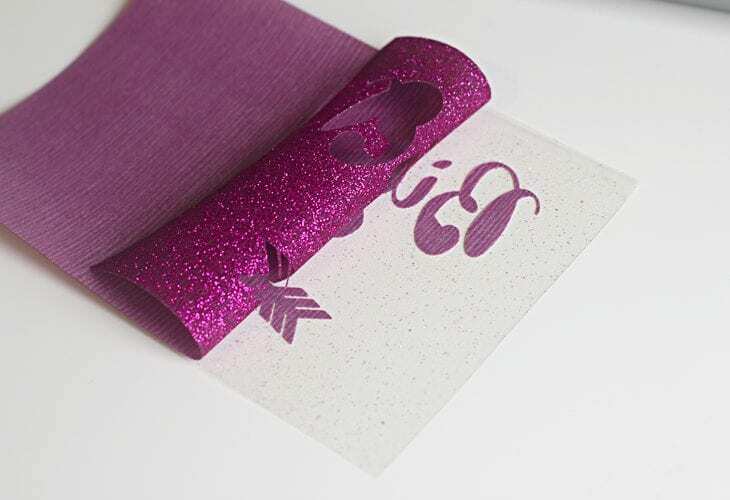 Now, place your HTV with the clear film against the sticky side of your mat and cut your HTV. 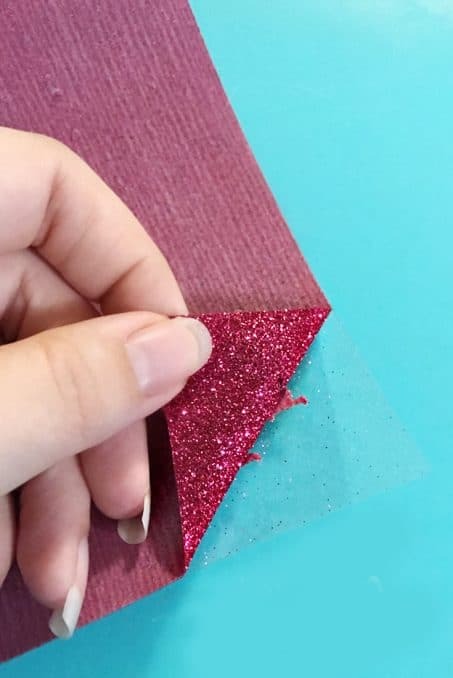 This is the hot pink glitter HTV I used. Tip: Before you unroll your mat from the feeders when it’s down cutting, check to make sure it cut all the way through. If it didn’t then you can just send it back through to cut again. If you remove it from the feeder though and then realize it didn’t cut everything well it’s nearly impossible to get it back in the exact perfect spot to make another cut pass in the same spot. Once your vinyl is cut, time to weed. Remove all the vinyl you don’t want going on your fabric. Once your iron is heated up, place your vinyl on your fabric with the plastic sheet between your vinyl and the iron. 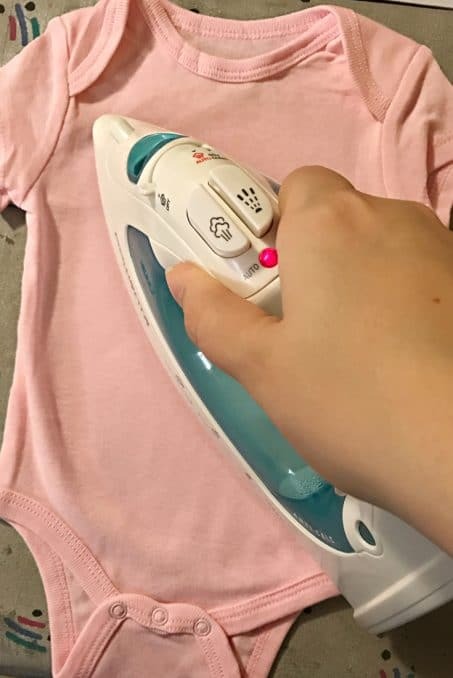 Now press your iron onto the HTV for about 10 seconds. Lift up and repeat until the whole sheet has been pressed down with the iron. You don’t want to move the iron around because your vinyl could move and won’t adhere well. All you need to do is pull up the plastic sheet slowly and you’re done. If you notice the vinyl start to pull up a little, just press the iron for a few more seconds until it sticks. Tip: Make at least two onesie’s — newborn and 0-3 month size — in case you have a big baby and are using this onesie to introduce your baby to the world. Don’t be intimidated like I was. 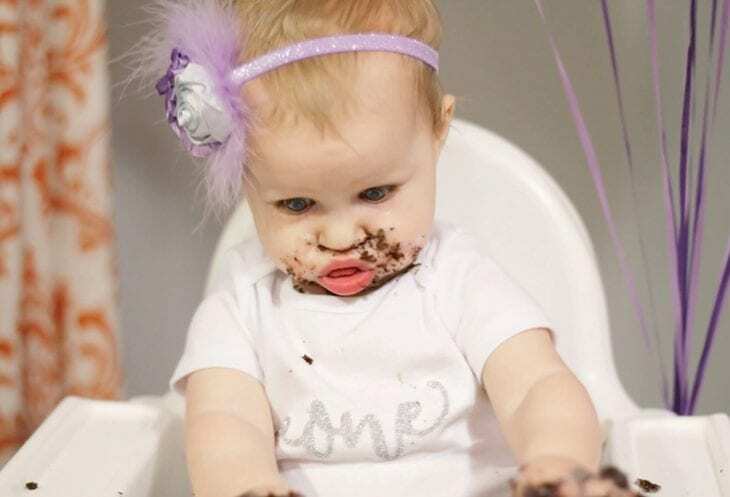 When I made Mini Me’s first birthday onesie, I used fabric and iron-on transfer paper. It worked great for temporary use, but didn’t adhere great to the onesie and started coming up after only a few wears. 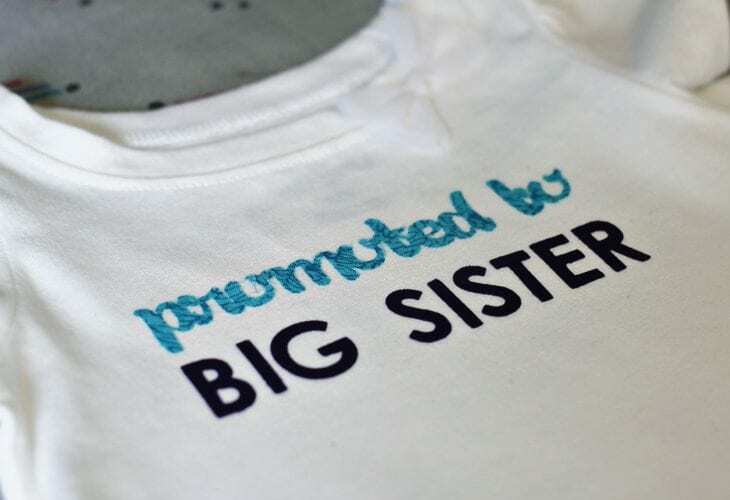 Same with the shirt I did to announce Mini Me was going to be a big sister. The HTV, however, is amazing! Mini Me wears her big sister shirt all the time and I can’t count how many times it’s been through the wash and it still looks brand new. 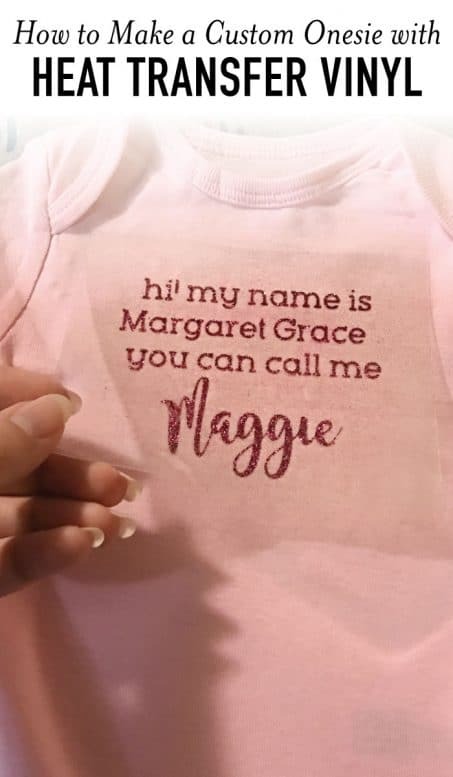 Same with Little Miss’s announcement onesie. So good! I love how simple it is to make custom onesies and can’t believe I waited so long to try it out. What saying would you add to a onesie? This is SO precious! Love those onesies – and it looks so simple! About how big did you make your words on your onesies? I have a saying to put on one just can’t seem to get my words the right size .